COGELME recycling machines are engineered and produced for your comfortable working environment to best achieve your performance objectives. Equipments can be optimally integrated in your current setup to run efficient, profit-making ferrous, non-ferrous metals, glass, plastic sorting and processing. With our engineers extensive knowledge and creativity machines are designed according to your output objectives, your space and your budget. What is more, you take advantage of optimal value for money, because Cogelme delivers ultimate price/quality ratio machines in the industry. Optimum method for achieving clean end products. Enhanced processing capacity and profitability. High quality techniques and reliable non-stop operation. Safety and appropriate design equipment. Reduced labour costs and saved time. And not only that, Cogelme engineers have practice and give a hand for customers also in solving problems and adjusting other companies machines. 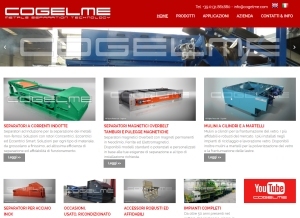 Enjoy your improved waste processing and enhanced profitability with Cogelme customized design systems!